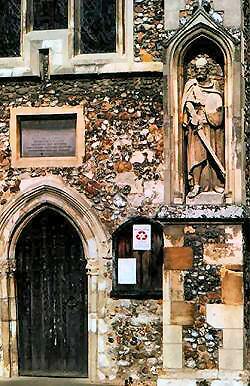 To this day, the statue of Earl Brithnoth stands guard by the entrance door to All Saints Church in Maldon High Street - of course, we have no idea what he actually looked like! However, some sources suggest that he was a man of huge physical stature - his bones were examined at Ely in 1769 and from these his height was estimated at 6 feet 9 inches (2.06m)! And this at a time when the average height was considerably less than it is today. Sometimes his name is spelt in different ways, other versions being Byrhtnoth or Beorhtnoth. A statue of Brithnoth has recently (2006) been erected in Maldon's Promenade Park - details here. In St Mary's Church on the riverside quay at Maldon, there is a stained glass window which depicts Brithnoth's dying prayer. After the battle, Brithnoth's body was taken to Ely in Cambridgeshire, and was buried in the abbey. Brithnoth's widow, Aethelflaed, presented the abbey with "a curtain woven and depicted with the deeds of her husband as a memorial of his virtue", and this may have inspired the idea for the later Bayeux Tapestry commemorating the Battle of Hastings in 1066. A visit to the magnificent cathedral at Ely in the Cambridgeshire fens was rewarded by the opportunity to see Brithnoth's final resting place - however, although his bones lie here, his head is missing, and no doubt the Vikings did unspeakable things to it at the conclusion of the battle. As the cathedral was built, Brithnoth's remains were moved to their present location. He shares his tomb with six others in Bishop West's Chapel which lies in the south-east corner of the cathedral. This chapel was completed in about 1530, and has a beautiful ceiling and carvings. 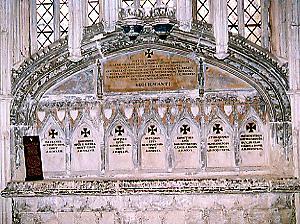 "Beneath are buried the bones of seven men who served very well the people of Ely. 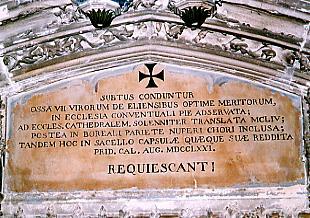 Preserved piously in the abbey church; solemnly transferred to the cathedral church in 1154; afterwards enclosed in the north wall of the recent choir; finally each was placed in its own coffin in the chapel on 31st July 1771. May they rest in peace." Brithnoth's tomb is the right-most of the group. 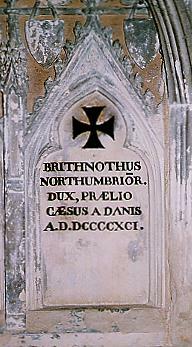 "Brithnoth, Duke of Northumberland, killed in battle by the Danes 991 AD"